New Orleans Indie Rock Collective: Your Face Could Help The Scene. Your Face Could Help The Scene. New Orleans music scene is changing. According to one study NOLA has officially surpassed both NYC and Austin as the live-music capital of the world. But that's just one study. We all know New Orleans has always been one of the best places in the world for music and that's because of the bands that are working so hard and the fans who dutifully come out to support them. We've seen some crazy successes and heard some great local albums and attended some pretty wonderful shows in the past year. 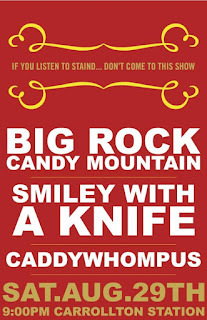 Keep this strong and help Zack Smith, a local awesome photographer/drummer, by attending the Big Rock Candy Mountain, Caddywhompus, Smiley with a Knife show this Saturday at Carrollton Station. Zack will be shooting his 1st installment of "Rock Portraits" at the Carrollton Station show. Each image shot will be collected and printed into a large format that will become a part of New Orleans 'Rock History'. Think you support the scene? Well... come show your face. Blue Party goes to America.